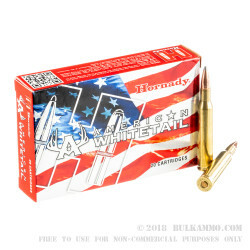 Hornady’s American Whitetail series is the perfect load for your deer rifle. 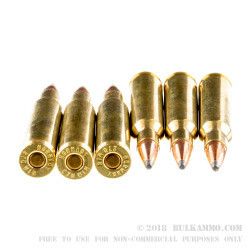 These cartridges use Hornady’s Interlock soft-point bullet, which employs a locking ring to bind the copper jacket and the lead core together for maximum impact on the target. The Interlock design also features careful weakening of the jacket near the exposed soft point to maximize the round’s expansion at extended ranges. 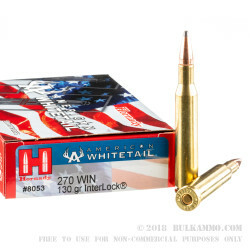 This .270 Winchester load of the Whitetail line propels a light 130 grain Interlock bullet at a high muzzle velocity of 2,825 feet per second for a flat-shooting trajectory. Each cartridge in this box of 20 uses Boxer-primed reloadable brass cases. For more than half a century, the Hornady name has been synonymous with cutting-edge bullet design. The company’s Interlock bullets have earned renown for their effectiveness at taking game, while the XTP design is a proven self-defense round used by law enforcement officers and CCW holders. The company’s loaded ammunition is a relatively recent venture that began in the 1990s and quickly became a major success. Hornady continues to make waves in the ammunition industry; its recent introductions include the new polymer-tipped FTX jacketed hollow point and Interlock hunting soft point bullets.